Preheat the oven to 325F(170C). Put butter and sugar in the medium bowl of an electric mixer and beat until light and fluffy (approx 5 minutes). Fold through the flour, alternately with buttermilk, and stir until well combined. Bake for 15-20 minutes or until a skewer inserted in the center of a cupcake comes out clean. Leave in trays for five minutes before turning onto a wire rack to cool completely. Thanks so much for sending in your gourmet cupcake recipe. I would imagine it would keep really well and be quite light in texture. This cupcake could be teamed up with so many frostings and would be great served as wedding cupcakes. I love this recipe and I am sure that I should try it! The photo of your cupcake is so nice! 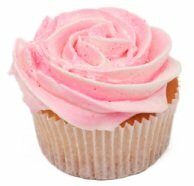 How did you do rose on the Cupcake? Looks really good!